Deploying solutions to support all five patterns insures that your organization will get the maximum ROI from your GIS. These five patterns are common to all organizations. If you are an ArcGIS platform user, then it is important that you understand these patterns, because they are driving the development of the platform. Because these five patterns are common to all organizations, and Esri can provide a location platform that supports all of them, any organization can get the benefits of GIS in just about everything they do. The “five patterns of business” are common to all organizations, and the ArcGIS platform supports them all. An interesting observation is that as you move from left to right across the different patterns shown above, the potential ROI increases while the software cost per user decreases. This means there is more potential ROI in the three patterns on the right side, so you should be prioritizing your work there. Let’s review each of the patterns briefly. Data Management. Data Management describes the process for storing, managing, and accessing data. It is usually the first pattern, or phase, an organization executes during the implementation of GIS technology. Normally this pattern requires the most resources. This pattern typically requires high-end software, hardware, and staff, and provides the data that fuels the rest of the patterns. Planning & Analysis. 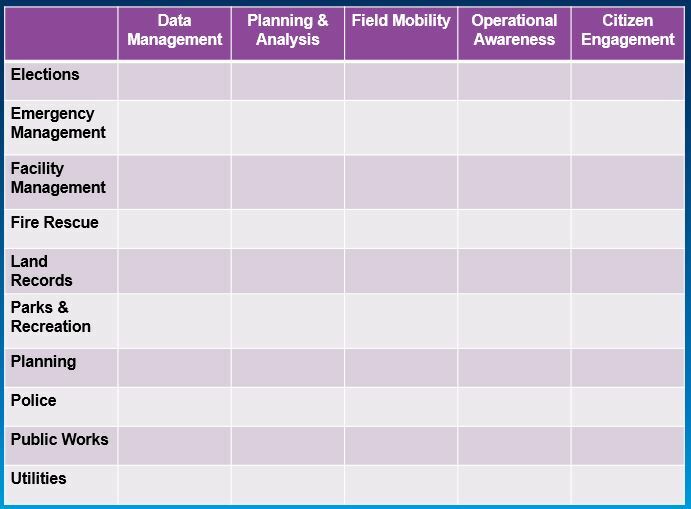 Planning & Analysis involves the practice of transforming raw data into actionable information through the application of analytical techniques. The ArcGIS geoprocessing framework offers a complete set of spatial analytical functions and tools, including feature overlays, selections, tracing, and modeling to help you do this. Field Mobility. Consumers and producers of spatial data have long had a need to get information into and out of the field. 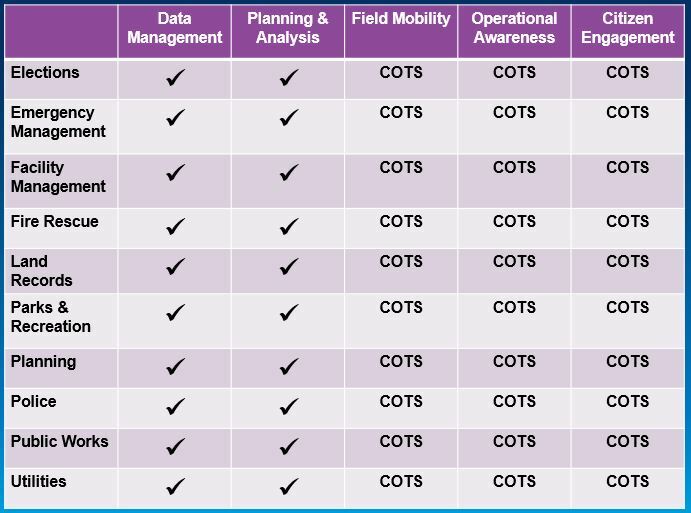 Field personnel require a simple solution for data exchange, collection, and updates. 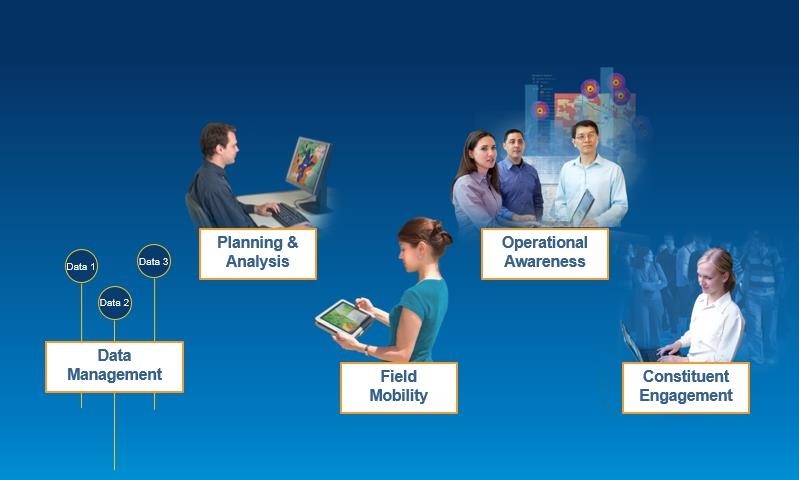 The ArcGIS platform provides multiple mobile deployment options to meet the different business needs of mobile users in connected and disconnected environments as well across different hardware platforms. Operational Awareness. An up-to-date and accurate picture of organizational activities is a critical component to understanding current operational status. Operational Awareness applications are often referred to as executive/operational dashboards or a Common Operating Picture (COP), providing a window to relevant and actionable information. 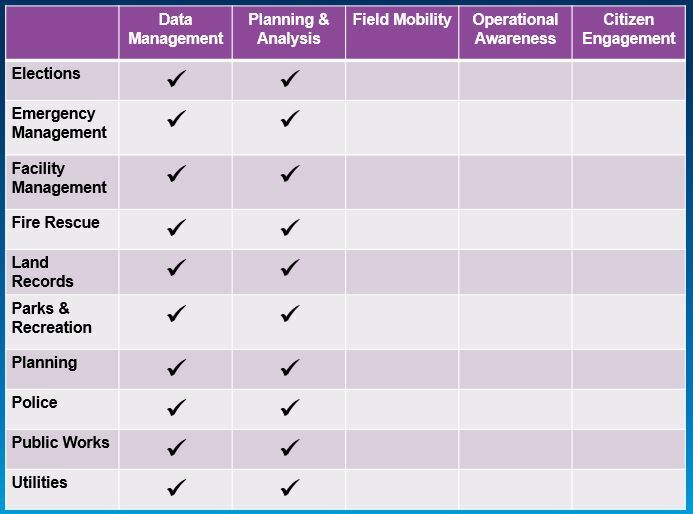 Operational Awareness applications should not be considered as simple data viewers. They can fully leverage the analytical capabilities of the enterprise GIS and provide additional powerful analytical tools as well as editing. Constituent Engagement. Governments are increasingly using GIS as a platform to build mapping applications that engage citizens, deliver transparency, and enhance policymaking. GIS integrates geospatial services in the cloud, real-time data, user-generated content, mobile applications, and social networks to promote open government practices that leaders and citizens expect. Governments of all sizes at every level are using geospatial information today as a framework for collaboration. It is important to constantly look for opportunities to implement solutions across all five patterns during daily operations. An example of this would be if someone requested a map of the community showing all of the foreclosures. Under normal circumstances, that map would be made and delivered to the customer and that may be the end of the involvement of GIS with that project. In that example, the GIS solution has stopped with the Data Management pattern. A better alternative would be to inquire why the map is needed, in order to try to discover the business need behind the request. This may lead to additional opportunities for implementing GIS solutions across all of the five patterns. For instance, under the Planning & Analysis pattern, the foreclosure information could be analyzed to see if there are concentrations of foreclosures, or a correlation between foreclosure locations and the locations of crime and/or code violations. The foreclosure locations may also be negatively affecting property values in the surrounding areas. This additional intelligence can really help make a difference in the community on multiple levels and help make better decisions. For the Field Mobility pattern, the foreclosure information could be very useful for code and law enforcement officers in the field. If code enforcement officers knew which homes on a block were foreclosures, they could slow down to see if there are any code violations. If law enforcement officers knew which homes on a block are foreclosures, they could slow down to see if there are any criminal activities going on. This access to critical data in the field can increase efficiency and level of service as well as allow for more proactive actions. For the Operational Awareness pattern, providing direct access to the data via an easy-to-use web interface helps maximize the value and associated benefits. City staff could query, select, analyze, and print the data to help them answer questions, solve problems, and support collaboration. For the Constituent Engagement pattern, if the data was made accessible to the public, it could also create value. If citizens in a neighborhood knew where the foreclosures in their neighborhood were located, they could help keep an eye on them as part of their neighborhood watch program. They may even help keep up the properties to insure their property values are not negatively affected. Homeowner associations would know who to contact regarding payments of dues and violations of deed restrictions. The real estate industry could also find value in direct and easy access to foreclosure data in a spatial context. Solutions like this help reinforce transparency and accountability and increase efficiency and level of service. A mobile solution could be implemented that allows citizens to verify/falsify foreclosures. This real-time input and interaction from the public will bring value and increased efficiency and level of service. Then as we deploy solutions, we simply check off the boxes. For most existing GIS departments, they have already deployed solutions for Data Management and Planning & Analysis. So the goal would be to check off the remaining empty cells in the matrix. The most sustainable way of doing that is with COTS applications. So follow the five patterns of business to sustainably build a mature, successful, robust GIS that supports all of your departments and their business. This will bring you the highest ROI on your GIS investment and allow you to take advantage of all of the capabilities of the ArcGIS platform.